SCVHistory.com LW2856 | Valencia | Magic Mountain Sky Tower Sponsored by Western Airlines, 1977-78. Los Angeles-based Western Airlines sponsored the Magic Mountain Sky Tower in 1977-78. "Western Airlines" was spelled out across the lower observation deck, and the airline's stylized "W" logo appeared on steel panels that were welded to the tower's hexagonal frame. At the time, guests could ride one of the tower's two elevators to enjoy a 360-degree view of the Santa Clarita Valley from 384 feet in the air. After Western Airlines' advertising contract ran out — around the same time The Newhall Land and Farming Co. was trying to sell the park — the steel panels were painted over, in the same red color as the rest of the tower. Last we looked, the panels were still there. Established in 1925 as Western Air Express, Western Airlines merged into Delta in 1987. 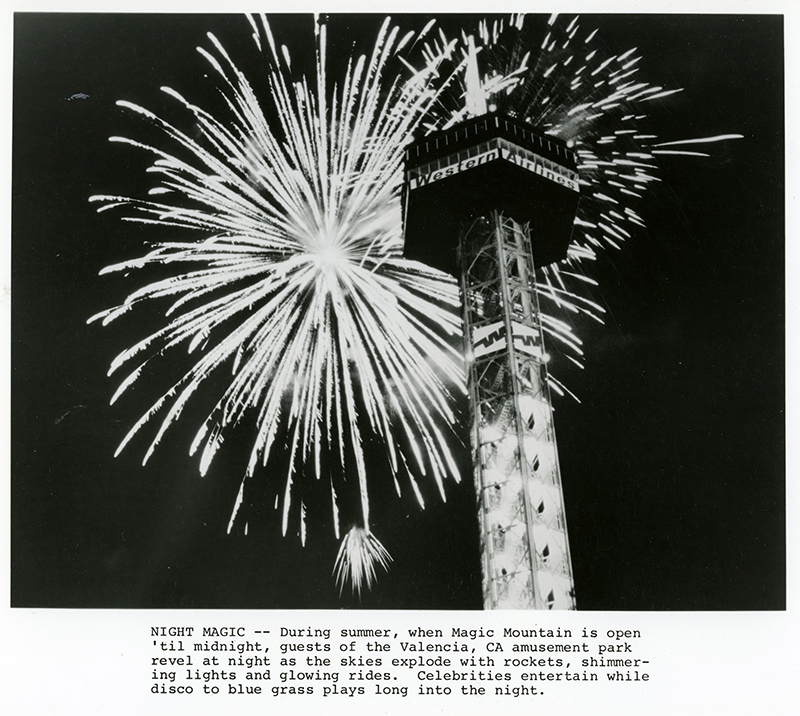 NIGHT MAGIC — During summer, when Magic Mountain is open 'til midnight, guests of the Valencia, CA amusement park revel at night as the skies explode with rockets, shimmering lights and glowing rides. Celebrities entertain while disco to bluegrass plays long into the night. The Western Airlines sponsored Skytower is 386' high [sic] ... that's 32 stories! It was constructed in Switzerland and shipped in sections to Magic Mountain. Up in the observation satellite you will find yourself in the very center of Western's World, since Western Airlines flies from Alaska in the North to Mexico in the South, and from Florida in the East, all the way to Hawaii in the West. LW2856: 9600 dpi jpeg from original photograph purchased 2016 by Leon Worden.